The Winnebago County Sheriff's Office has released new video and information about the Interstate 41 pileup in late February. NEENAH — The Winnebago County Sheriff's Office released new video and information about the Interstate 41 crash in late February. The video was shown at Tuesday's Winnebago County Board meeting. 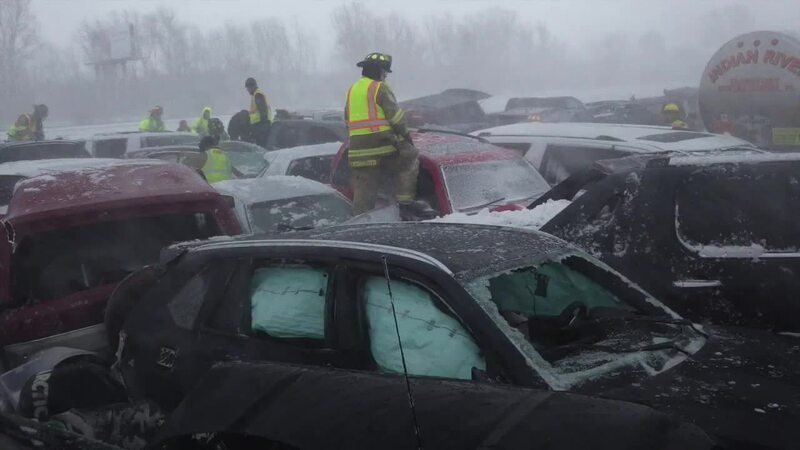 The Feb. 24 pileup, which involved 232 people, is the largest crash in Wisconsin history, the sheriff's office said. Seventy-one people were taken to area hospitals, and 144 injuries were reported. Of the 119 vehicles involved, 110 had to be towed. Five area wrecker companies used 20 tow trucks to remove the vehicles and two semi-trailer trucks. Between 800 and 1,000 vehicles were stuck on I-41 behind the crash, the sheriff’s office said. The southbound lane of I-41 was closed about 16 hours during the cleanup. The chain-reaction crash happened in the Neenah area amid whiteout conditions.